are pre-installing Ignition on their devices. Learn Anytime. Learn Anywhere. All for free at Inductive University. Inductive University has hundreds of Ignition videos led by the experts to get you trained, or to help you find quick answers. With Ignition, you can seamlessly collect all your data, design any kind of industrial application with ease, and instantly web-deploy clients to anyone, anywhere. For the affordable cost of one Ignition server license you get an unlimited number of clients, tags, connections, and designers so you can build the exact system you need, without limits. Ignition is a powerful integrated development environment with everything you need to create virtually any kind of industrial application – SCADA, IIoT, MES and beyond – all on one platform. Easily control, track, display, and analyze your processes. Make your data more accessible and efficient with MQTT. Track your production, manage recipes, calculate OEE, and more. Build optimized screens to monitor and control your machinery. Build complex alarming systems with ease and get notifications instantly. Easily create and deliver dynamic, database-driven industrial reports. Capture and visualize critical data at the remote edge of your network. Empower your teams with better data to make smarter decisions. Build mobile-responsive industrial applications using HTML5. See what our community has to say about Ignition and how it has transformed their businesses and workflows. To experience the powerful Ignition community firsthand, come to our annual Ignition Community Conference. 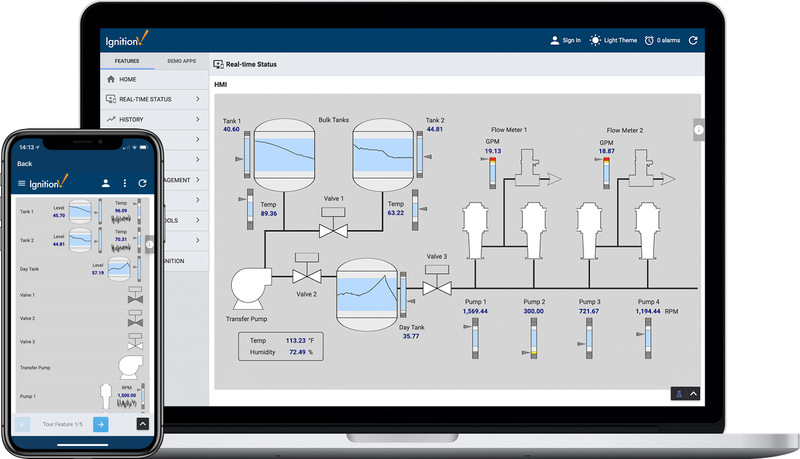 Sierra Nevada Brewing Company uses Ignition for its entire facility. Ignition software is the first truly universal industrial application platform for connecting all your data, and designing and deploying industrial applications throughout an enterprise, without limits. It consists of the Ignition platform and Ignition modules that add powerful functionality, empowering the creation of virtually any kind of industrial application including SCADA, MES, IIoT, reporting, alarming, and more. What are Ignition modules, and how do they work? You can extend the development power of Ignition by adding fully integrated software modules. Because Ignition is a modular platform, you only pay for the functionality that you need. All modules are hot-pluggable, so you can install, remove, and upgrade them without impacting your operations in any way. Ignition has a server-centric web-based deployment model so you can instantly web-launch an unlimited number of zero-install, full runtime clients on virtually any device. Ignition’s architecture is flexible and scalable — from a small single-client installation to an enterprise-wide system — so it can be tailored to fit your specific needs. How long does Ignition take to install? Ignition only takes 3 minutes to install. Install it once, in one place on the server, and then you can instantly launch client screens to just about any device. You can download it for yourself right here. What can Ignition connect to? Ignition connects seamlessly to any SQL database and to practically any PLC through third-party OPC servers and its built-in OPC UA. Ignition can also easily connect to SMTP, VOIP, SMS, serial devices, web services, MQTT, and more. Ignition is cross-platform compatible so it can run on Windows 7, 8, and 10, and Windows Server 2008, 2012, and 2016, as well as Linux and macOS. Ignition can run on any device that runs Java, including PCs, laptops, servers, tablets, smartphones, remote field devices, and even Raspberry Pi’s. How does Ignition’s unlimited licensing work? Ignition is sold by the server, so you get an unlimited number of clients, tags, and connections, all for the affordable cost of one license — the only limiting factor for Ignition is the performance of the hardware you install it on. Visit our Unlimited Licensing page to learn more. How does Ignition’s free trial work? You can download the full version of Ignition for free on our download page. Ignition only takes three minutes to install and it comes with all the core modules. By default, Ignition will run in trial mode which will timeout after two hours but you can manually reset it as many times as you wish, which allows you to build and test a full project in Ignition without buying a license. Once you’re ready, you can purchase and install your Ignition license key, which will take Ignition out of trial mode by removing the two-hour timeout. All your previous work will be saved with no additional installation required. Ignition is made by Inductive Automation, based in Folsom, California. Inductive Automation was founded in 2003 by Steve Hechtman, a systems integrator with over 25 years of experience who grew frustrated by limited and burdensome software solutions that stopped him from fully meeting his customers’ needs . Ignition was born out of his vision to empower our customers to swiftly turn great ideas into reality by removing all technological and economic obstacles. Learn more about Inductive Automation and our leadership team on the About Us section.